The sound from these headphones is a delight to listen to! The bass is tight, the vocals are precisely defined, and there is a wonderful sense of space, balance and clarity across the whole audio range. 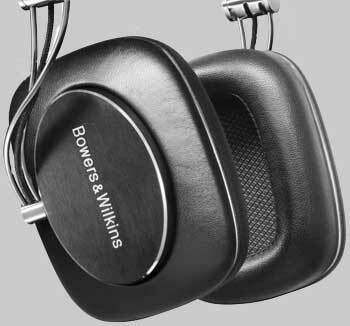 Bowers and Wilkins has created a headphone drivers that works more like the drive unit in a hi-fi speaker, with a diaphragm focused purely on the job it's supposed to do: generate wonderful music! This is a pair headphones that you easily listen to all day without a hint of listening fatigue or any discomfort whatsoever! Headphone listening has become very popular thanks to a variety of neat gadgets from the iPod, Smart Phones, to listening from music streaming from your computer. Also the choices of headphones from a vast array of companies can make all the difference in your musical enjoyment. 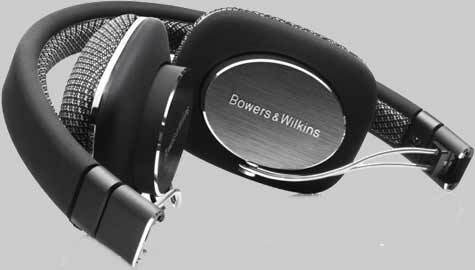 Enter the new Bowers and Wilkins P-7 Headphones! Offering a higher level of performance than their critically acclaimed P-5 headphone, the P-7 is a "closed back" style of headphone that keeps the music from disturbing people sitting close by like at a plane, living room, etc. all the while enhancing your musical experience. Just before we tried them on, we took some time to admire the beautiful styling. You can easily tell that no corners were cut in regards to build quality and their choice of materials. All the moving parts and back plates are constructed from brushed and stainless steel. The logo plates to make this a closed style of headphones are crafted from brushed aluminum. The high-quality and flexible headphone cable comes with a remote/microphone attachment, so it works seamlessly with your iPhone. And because the cable is so easy to detach and swap, the P-7 is also compatible with all other mobile phones and MP3 players. The headphones also fold up nicely and even come with an attractive hard case to help keep them well protected. 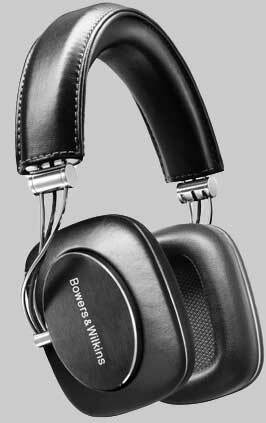 And to complete this impressive build quality of these headphones, Bowers and Wilkins selected beautifully stitched leather for the headband and leather ear cups that wrap around your ears to help make this a very comfortable pair of phones to wear, even for marathon listening session. So if beautiful sound and accurate sound quality is important to you, as well as, a pair of headphones that are crafted like no other and will not fall apart like many other headphones out there, your search is over, the new Bowers and Wilkins P-7 have raised the bar on what a quality pair of headphones should look and sound like! These headphones are an excellent choice for the perfect gift for the music lover, or a treat for you! Come down to The Stereo Shop and audition a pair today; your ears and your music will thank you. 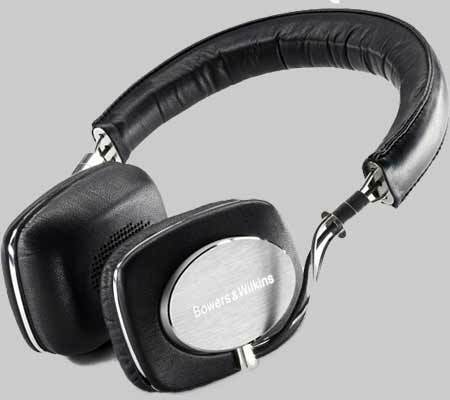 These exciting new headphones from Bowers and Wilkins will not only sound awesome on your home stereo system but you won't believe how good they will make your iPod, iPhone or other MP3 player sound. When Apple wanted an iPod docking music system that was designed and built to the same exacting standards as the iPod and iPhone itself, they looked to B&W. The result was the incredible B&W Zeppelin. Apple liked it so much (as have many, many music lovers) that they asked B&W to design a set of headphones of the same caliber. The result of this new project is the amazing P-5 headphones. Equally well suited for your home stereo system and you won't believe how good they will make your iPod or iPhone sound, as well as other portable players alike. Experience the stress of everyday life melt away with the new B&W P-3 headphones; From excited kids in the family room, to phone calls from the office, all will be soothed by the P-3. An impeccably designed noise blocking headphone, the P-3 brings personal musical performance unadulterated into the comfort of your own home. Covered in a cloth, the headphones breathe easily for maximum comfort, and include two sets of cords, one inset with an iPhone ready mic. The sound quality offered by the P-3 is of course extraordinary, as B&W continues to prove its superiority in speaker design. And as the headphone is outfitted with a closed system, you won't be noticing any surrounding sound, nor will those around notice you. Perfect for commutes and trips of all sorts. 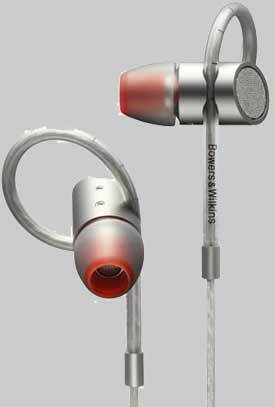 When Bowers and Wilkins decided to design an in-ear headphone, their greatest concerns were comfort and great sound. To provide this comfort, and increased stability, the C-5 has been designed with a loop at the earphone which circles the ear and prevents movement. And as a secure fit doubles as increased noise isolation, the sound of the C-5 is also improved along with your comfort while listening to your favorite music.